Inspired by the Roland TR-606 Drumatix, the Cyclone Analogic TT-606 Drum Drone is an analogue drum processor featuring an additional sequencer and expanded option set. The TT-606 has individual outputs for each instrument, MIDI In/Out & Thru, headphone jack and an amplifier send. The instruments included are bass drum, snare, low & high toms, cymbal, open & closed hihats, rimshot and clap. A fixed parameter can be adjusted for each sound using the instrument selection switch whilst the sequencer is running. The parameters for each sound are as follows: Bass drum – Pitch, Snare drum – Snappy, Low & High Toms – Pitch, Cymbal – Decay, Open HiHat – Decay, Close HiHat – Pitch, Rim Shot – Decay and Clap – Mix Noise. Furthermore each track has access to an additional ACCENT track, FLAM track and ROLL track. Considering purchasing the Cyclone Analogic TT-606 Drum Drone? Have questions? Ask people who've recently bought one. 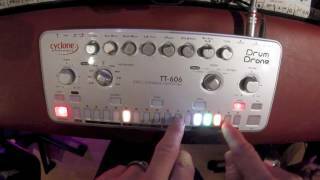 Do you own the Cyclone Analogic TT-606 Drum Drone? Why not write a review based on your experience with it. 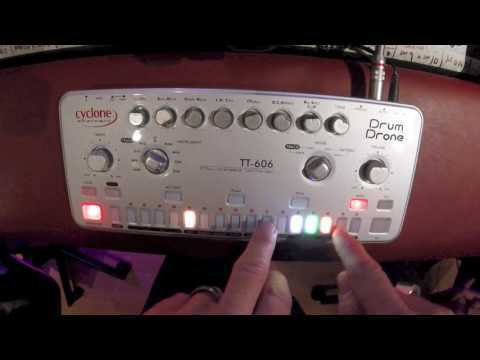 Seen a video for Cyclone Analogic TT-606 Drum Drone online or have you own video? You will earn 1,556 loyalty points with this product worth £3.89, when logged in. Check out Cyclone Analogic TT-606 Drum Drone on DJkit.com!